Prayer is a constant conversation with God. Yes, there will be times when we need to go and spend some time alone in prayer. Having a dedicated prayer time is very important, but we don’t have to wait until that dedicated time to pray. 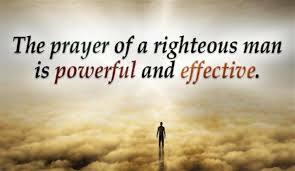 1 Thessalonians 5:17 tells us to pray continually. As we go about our day, we can pray. We can praise when things are going right. We can ask for help when things are going wrong. We can pray when someone or a circumstance needs our immediate prayer. I have gotten to the point that I pray all day. There are times when God will point out a character flaw and I immediately need to repent (shocking I know!) It has brought me so much closer to my heavenly Father. God is with us wherever we go and hears us no matter where we are. Prayer is praying God’s Word back to Him. There are times when I will come across a Bible verse that really speaks to me and I will rewrite the verse as a prayer back to God. Praying God’s Word back to Him can be very powerful. Not that God ever needs to be reminded of what He has written, but He invites us to remind Him of His Word. He invites us to remind Him of His promises. Praying scripture can be a powerful tool in partnering with God in bringing His will on earth. Prayer is a partnership with God. The one thing that I have been humbled by is that God invites us to partner with Him in His will. We can change things in this world, when we pray for God’s will on earth. When we pray for God to intervene in situations where evil reigns or where healing is needed, we are partnering with God in bringing His will into our lives and in this world. We can pray for God’s intervention in another part of the world and God will move mountains. Things CAN change when we partner with God through prayer! That is so cool! God sometimes says NO! This is one of the hard things about prayer. When we are praying for what we feel is God’s will for someone or a situation and God says NO! it can be devastating. When we are praying for the best possible outcome and God says NO! It can be frustrating and it can be a blow to our faith, but here’s the thing: God does not always have to say YES! God is the only one who has the ability to see the whole picture and He answers our prayers based on what is best for us. He doesn’t owe us any explanation in answering the way He does. He only asks us to trust Him. The Holy Spirit will intervene for us. Romans 8:26-27 26 In the same way, the Spirit helps us in our weakness. We do not know what we ought to pray for, but the Spirit himself intercedes for us through wordless groans. 27 And he who searches our hearts knows the mind of the Spirit, because the Spirit intercedes for God’s people in accordance with the will of God. There have been times when I don’t have any more words to pray and I have to ask the Holy Spirit to intervene and pray on my behalf. There are other times when I have been to exhausted or overwhelmed to pray and my prayer is a simple, “Jesus, don’t let me go.” I know at those times that the Holy Spirit is praying on my behalf and that my prayers will continue to be lifted up to Heaven. There is power in numbers. Matthew 18:20 tells us that where 2 or 3 gather in His name that He is there in the midst of them. When we gather together to pray for a situation, strongholds WILL be torn down, chains WILL be broken, prison doors WILL come crashing down. When God’s people join together in unity to pray over a situation EVIL WILL FLEE! When God’s people can get passed the things that keep us apart and really join together in God’s will GOD WILL WORK MIRACLES!!! Prayer is listening to God. Just as in any other conversation, we have our chance to talk, but we also need to listen to what the other person is saying. This isn’t any different with prayer. We need to take the time to LISTEN to what God has to say to us. God will usually speak through a whispering to the spirit or in some other gentle, subtle way, so we really need to take the time to be still and listen with our hearts. God will give us direction, He will comfort us, He will give us wisdom…IF we quiet the noise around and in us and sit at His feet and listen. Prayer is NOT one size fits all. Prayer can take many different forms. We can pray with scripture, we can pray with prayer beads, we can pray form prayers, we can pray through song, you get the point. There are as many ways to pray as there are prayers. We can pray standing, kneeling, with hands raised or prostrate on the ground. We can pray in any way that God leads us. There is no right or wrong, as long, as we are putting God at the center of our prayers. God acts in answer to our prayers. I have learned in my 25 years as a mom that God will act according to my prayers. I am not saying that He is a puppet on a string. I am saying that He loves us as any parent loves their child and will honor our requests, as long as, they are in accordance to His will. I have prayed for the protection and provision of my kids their entire lives and God has kept them safe when they have faced uncertain circumstances. I have trusted that God would bring them out whole and He has. I have been blessed to have had the best prayer instructor ever: the Holy Spirit. Prayer does not have to be difficult. You learn by doing. I know that as much as I have learned about prayer, it doesn’t even scratch the surface to what I still need to learn. As in all things God, prayer is a journey. Some things will work for us and other things won’t. Take the time to experiment and find what fits you best. The most important thing I can say, is simply, START! You just need to start the conversation and be open to where God leads. Keep your heart open and ask the Holy Spirit to teach you. A life in prayer is one of the most humbling, satisfying, world changing things we can ever do. Take it from me, a single mom of 18 years. I never could have raised five kids without prayer and knowing that God protects, provides, and transforms because I pray.